I wanted to write a few words about what I see as the difference between philosophy and spirituality. I realize, naturally, that anything I say can only be some overly generalized distinction that may be helpful to some, but could never be definitive in any way. At the very least this distinction is something that I have been thinking about a great deal and I continue to feel compelled to think it through and to try to articulate what I come to over and over and over again. Like making a line of demarcation in wet mud with your finger, this distinction may help me see a difference for a moment, but inevitably it will fade, blur and ultimately disappear as time goes on. One last disclaimer is that, as I see it, philosophy and spirituality are opposing poles on a continuum. Some philosophies are more spiritual in nature and some spiritualities are more philosophical. So again I am trying to make a distinction that is clear and crisp where none probably exists. In short I have been thinking about the fact that philosophies are theories that attempt to describe the nature of reality. In their most ambitious form they are “theories of everything” that attempt to explain what all of reality is made of and how it all works together to create the world as we experience it. So, again being ludicrously over simple, philosophy is composed of philosophical theories about reality. 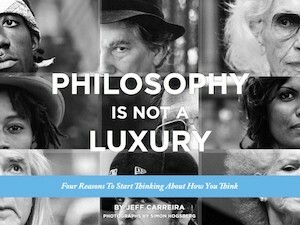 What philosophy doesn’t do is tell you how you should relate to all that. Philosophy might describe ethics in the sense of what is right and what is wrong, but it will generally veer away from directly telling you that you should do what is right. Maybe philosophers feel that is self-evident anyway. Spirituality on the other hand rushes straight into the challenge of telling you how to relate to reality. Spiritual teachings are direct instructions about how you should live. They are based on a philosophy, but usually their main emphasis is on changing the way human beings relate to reality rather than describing it. A philosophy is describing a view of reality from the outside. Similar to science, it attempts to reveal the objective truth about the way things are. Spirituality, on the other hand, approaches reality from the inside out. It is a subjective view of reality that ultimately points to a way of being that we should adopt in the world. I believe that a spiritual teaching is, in the end, the description of a position that we should take in the world. It is a stand that we adopt and hold. It is a relationship to the world, not a description of it. Both are critical. One rests on the other, in fact. As a self-proclaimed romantic my tendencies take me toward spiritual teachings, but recently I have been reading about existential philosophy and I am finding that philosophy shares this emphasis on a stand in the world. I will be expanding more on that as this blog goes on. I think you are onto a useful distinction, Jeff. But as you said, there are a few philosophical movements that have focused on or at least included discussion on our relationship to the world, to ourself, and to others. From what I’ve read that includes existentialists, objectivists, and the pre-socratics (the stoics come to mind). To me it always seemed that understanding reality was a necessary pre-requisite to formulating an ethical position. One was the basis of the other. Of course just coming to terms with one philosophical branch can take years so you have to assume something in the meantime. The other thing that always occurred to me was that philosophers of all stripes: atheist, theists, agnostics, and anything else, are all driven by what could be considered a spiritual urge. Hegel said philosophers, artists, and saints were all concerned with the “realm of absolute spirit” and motivated by the same basic force. Even Nietzsche, perhaps the most famous atheist, spent most of his life pondering religion. The fact that he ultimately chose atheism misleads the casual reader from the deeper truth that he actually thought the existence or non existence of God was a deeply important issue that was worth years of his time and deep contemplation – unlike today’s carefree, inherited, atheists. But it was a harrowing inner battle and a “live” issue for him in his time. Finally, I have a great quote somewhere by someone (I should really get my facts together before I start quoting) that basically says “the philosophical journey first leads to atheism, then to divinity.” I think there is something inherently noble and spiritual about a serious philosophical inquiry, if motivated for something greater than tenure! I am glad you brought up Nietzsche Jane and by the way that is quite a beautiful comment you penned. I am more a mystic myself by temperament, but I have always been drawn to philosophy by the power of it’s explanatory project as Jeff has mentioned. On Nietzsche, some years ago I listened to a CD set by the philosophers (and married couple) from the University of Texas, Robert Solomon and Kathleen Higgins. The set is called “What Nietzsche Really Said,” (they have a book by the same name) and in the lectures they point out, among other things, Nietzsche was, in fact, quite concerned about how we would live in the face of the breakdown of the belief in God. Over a century ago, Nietzsche anticipated a profound crisis in morality. He recognized that the old religious institutions were losing their credibility and influence. With their decline would come the ascent of scientific materialism. This new system, however, is a poor instrument for creating morality and virtue. Nietzsche offered an alternative: a morality from “within;” a perspective that sees life as worth living for its own sake and cultivating a character written with “style.” Nietzsche, according to Solomon and Higgins, is a living voice that sees life as a joy, encouraging us to treat every moment as such. As such, he was not only the father of existentialism, but the father of evolutionary spirituality. whoops, I meant James, not “Jane.” Sorry about that. I believe we are recovering our sense of reality, that science is unquestionably valuable to humanity but that spirituality must be given its due or we suffer the consequences of lower moral standards and a losing of the meaning of being human. Many have become less compassionate and caring of others and the other creatures who also comprise the Web of Life that proves rather delicate. I believe we are turning around and coming to embrace spirituality more and that religions are also responding to more modern ideas, absent Orthodoxies? I look at my library and try to decide which books are Philosophy and which are Spirituality. I do this with the background that in college I went through a Great Books program for two years at Seattle University, a Jesuit Catholic institution known for teaching critical thinking, etc. The reason I mention this is that in that program we studied History, Literature and what was called “Thought” in three interconnected seminars for two years, that began with Hindu, Buddhist and Middle Eastern periods and ended after two years with contemporary writers of literature, modern history, and current day “thought.” Probably 40% of my current library comes from that program of almost 40 years ago, and it includes the Upanishads and the Bhagavad Gita, the Old Testament, New Testament, Pre-Socratics, Greek and neo-Platonic periods, St. Augustine, St.Thomas Aquinas, the medieval Arabian writers, and so on and so on up through the periods you (Jeff) have been talking about in this blog. I’m not sure I can do a clean sort of these books and topics between Philosophy and Spirituality, which is why I like the fact that the seminar was called “Thought.” Was Plotinus a philosopher, a spiritual teacher, or both? How about The Buddha, or Socrates, or… you get the idea. Some were very interested in metaphysics and logic and other rather “dry” topics that might not have seemed to have implications for how we live. Others, including some of the Existentialists, seem ironically (because of their atheism) very spiritual, because they were certainly consumed with the “human spirit” and how we can or should live our lives with integrity and authenticity, whether it’s even possible to do so, etc. I mention all of this because to me it all comes together and, for example, the works of even some of the seemingly most “non-spiritual” philosophers or scientists, such as Einstein or Skinner or Richard Feynman, seem to have profound implications for what I can only call the spiritual life. To me, for example, the complete alignment between Skinner’s understanding of human behavior and the ancient non-dual teachings of Vedanta is so striking that it brings “philosophy” and “science” and “spirituality” together in a single, consistent understanding. Maybe rather than deciding whether something is more or less spiritual or philosophical, we could just see what implications the “thought” of some of these great writers have for how we should or can act, relate to one another, and engage in life altogether. In the end, I’m not even sure if “spiritual” vs. “non-spiritual” is useful, and it might even shut out valuable insights. Maybe this goes back to my specialization in St. Thomas Aquinas in graduate school, a man who firmly believed that the Truth is the Truth and science and revealed scripture MUST be consistent with one another if either one is to be taken seriously. I wonder if the growing numbers of those who embrace a spirituality without embracing religions or God, who attest that it’s possible to be good w/o those traditional beliefs are a progression from what Nietzsche was heading towards? If he were still alive, would he be espousing that concept of belief an spirituality? In our techy 21st century, traditional beliefs all seem a bit retro if they don’t recognize an interconnectivity that honors spirituality on a global and planetary way. I think that the type of people you describe “those who embrace a spirituality without embracing religion or God” are indeed a progression of the orientation to life that Nietzsche was aspiring toward. As I said, I consider him to be a spiritual man, as far as I understand the subject of spirituality…and yet he also evidently thought the idea of transcendental realms, values, and metaphysics overall, was poison to life. He instead wanted to justify the purpose and goodness of life on its own terms – without stepping back, seeking justification on a meta level. In fact, amongst his multifaceted critique of the existence of God, he traced it back to the way many languages are structured, with subjects than effect objects – therefore a God that creates a world. To answer your other question, I think if he were alive today, he would be pushing a different edge…his ultimate position on morality was “self overcoming” – to be a vehicle for the “will to power” (which is more like Eros or the evolutionary impulse – not power in the traditional sense) and for us to become a passionate people who are also disciplined masters of their passions, and most importantly, a master of their self. This moral prescription is still applicable today and it’s hard to imagine a time when it wouldn’t be. So if he were alive today I’d imagine he would want to overcome the postmodern status quo…and create something higher. Many aspects of his philosophy are now status quo…including his physical reductionism (reducing psychology and spiritual phenomenon to byproducts of physical processes). He seemed to think self overcoming and morality could work in a world that was understood naturalistically (non metaphysically). But if you consider that free will, and even causality, are metaphysical (non empirical, and merely assumed) then that’s a weak spot or inconsistency in his thinking. If self overcoming is the best way to live, which implies free will, and he would agree that free will does exist, then he would have to contend with metaphysics again, wouldn’t he? And perhaps then also God? TY for your very appreciated comments. I wonder if Nietzsche’s term Superman appropriated by Nazi sympathizers is actually a misunderstanding and actually is meant as that individual who has attained free will and is liberated from outside influence? Is this my misunderstanding of his term? Today I think that term is politically incorrect disregarding the females of our race. Humankind (not mankind) is half female and they may be the more spiritual component, no? Superpeople may sound better in German, it doesn’t go well with me. I wonder if Spiritually Awakened would cover the concept? What do you or anyone else think? I think, that one of the fundamental differences between philosophy and spirituality is that of the approach. While both try to interpret reality and search for “the right way” to lead one’s life (more or less), the philopher’s approach is of thought and analysis and a spritual person’s is that of intution and instinct. And while there is “generally” a lot of scholarship and academia in philosophy, spiritualism is more experiential. In the context of the Indian philosophies, I would cite Buddha or Ramakrishna Paramhansa as spiritualists and Kapil (of Sankhya Sutra) and Patanjali (of Yoga Sutra) as philosopher/ scholars. There is of course huge overlaps as well, and Adi Shankaracharya and Swami Vivekananda are two great examples of thought leaders who straddled both the world. Thank you for this Subir, you might find my next few posts interesting as well.